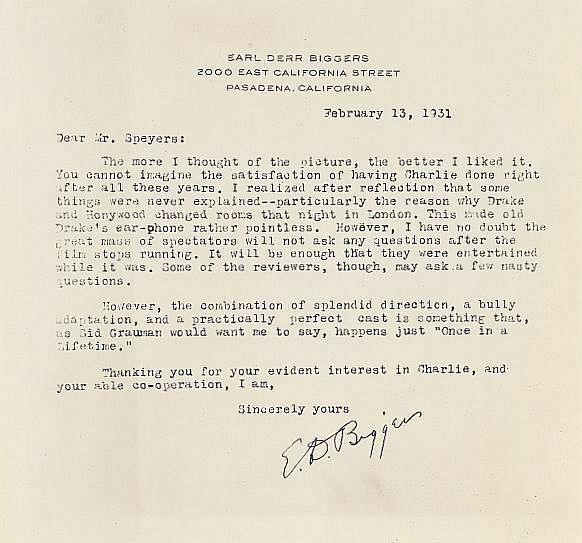 Earl Derr Biggers, the creator of Charlie Chan, probably wrote this letter after viewing Charlie Chan Carries On, the first of the Chan films in the series proper. Starring in his first appearance as the Chinese detective, Warner Oland obviously pleased the writer with his portrayal. Production on this picture was completed in late January of 1931, and, as the movie did not open until March 30 (Roxy Theatre, New York City) and was distributed beginning on April 12, Mr. Biggers was probably given a private preview.